The RC-3 Seabee was designed by Percival Hopkins "Spence" Spencer, an aviation pioneer who built his first hang glider in April 1911. At the time, he was 17 years old and constructed it from plans he found in a Popular Mechanics magazine. On May 15, 1914, Spencer made his first powered flight in a Curtiss flying boat. In 1937, he joined Sikorsky engineer Vincent A. Larsen to design their first and only amphibious aircraft, the Spencer-Larsen SL-12C. Development of the plane progressed slowly and in September 1940 Spencer left the partnership to form his own company. His resulting design was the Spencer S-12 Air Car Amphibian. Construction of the S-12 began on March 1, 1941 and the small, two-seat S-12 prototype, registered NX29098, made its first flight on August 8, 1941. 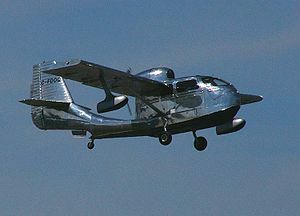 The S-12 was a fabric covered amphibian with a unique boxlike forward cabin; a high wing with a two-bladed propeller in pusher configuration; and a long, slender tail boom. In December 1941 Spencer put the Air Car into storage and joined the war effort as a test pilot for the Republic Aircraft Corporation. By 1943, he had flight tested 134 of the company's P-47 Thunderbolts. Military operators included the Israeli Air Force, Paraguayan Navy, the United States Army Air Forces and Republic of Vietnam Air Force. In order to meet the anticipated postwar demand for civilian light aircraft, Republic endeavored to build the Seabee as inexpensively as possible, while still retaining reasonable performance and range. A lot of thought went into eliminating what were at the time termed as 'airplane frills,' resulting in a strong product built with as few parts as possible. For example, Seabees as built did not have ribs in the wings; instead, the heavy corrugated aluminum sheet which formed the skin provided the necessary stiffness. Republic was also willing to buy components in volume, which lowered costs further. On November 22, 1945, the prototype RC-3 (NX87451) came off the assembly line at Republic's factory in Farmingdale, New York and on December 1 made its first flight in Farmingdale with Spencer at the controls. On December 27, 1945, Republic Aviation purchased Aircooled Motors, manufacturers of the Franklin engine, to supply and build engines for the RC-3 Seabee. In March, 1946, the first production RC-3 Seabee was completed (NC87457, formerly NX87457, and on July 25, 1946 the first Seabee (NC87463, production #13) was delivered at the Republic factory to J.G. (Tex) Rankin of Rankin Aviation Industries of Tulare, California. In the late 1940s, aircraft manufacturers hoped that military pilots returning from the war would want to continue flying civilian aircraft for pleasure and sport. This never occurred to the extent the companies imagined, as most wartime pilots returned home never to fly again. As a result, many small and optimistic aircraft companies appeared, then quickly disappeared in the immediate postwar years. On October 4, 1947, Republic Aviation Corp. announced that it was discontinuing production of the RC-3 Seabee amphibian for the personal plane market. Republic President Mundy I. Peale stated: "Due to the need of all Republic's production facilities for the manufacture of other types of airplanes, the company has decided to discontinue production of the Seabee". Actually, by summer (July/August) 1947 the Seabee sales had almost stalled and since June 1947 the production had been put on hold, awaiting further sales. By the end of production a respectable 1,060 Seabees had been built. Though this was far from the 5,000 Seabees per year Republic had hoped to sell, it still represented a significant number of airplanes compared to other struggling aircraft companies of the same era. Only Piper, with their cheap, long-lived Cub and Super Cub, Beech's popular Bonanza, and Cessna's early 140 and 120 light planes would sell in numbers greater than the Seabee. This was due in no small part to the very low price of the Seabee. During production, however, the price of the Seabee would rise from its original $3,500 to $4,495 effective July 15, 1946 and to $6,000 on November 15, 1946. Republic sold its last new Seabee in 1948. By that time the demand for civilian aircraft had shown itself to be far less than anticipated and the company turned its attention back to military contracts, developing the successful F-84 Thunderjet, which was built on the same assembly lines formerly used to build the Seabee. Seabees became popular in Canada and the USA and were also well-suited for operation in countries with long coastlines, many islands and lakes and large areas of wilderness. By the time production ended, 108 Seabees had been exported to several countries and dealerships were established in Brazil, Cuba, Panama, Colombia, Mexico, Uruguay, Peru, Venezuela, Chile, Argentina, Fiji, New Caledona, South Africa, England, Norway and Sweden. From the late 1940s and into the 1950s, the Seabee was a popular bush plane and air ambulance in Canada, Norway, Sweden and the USA. In 2006, over 250 Seabees are still registered and flying, a number that is increasing yearly as new aircraft are assembled from parts and wrecks. A few Seabees are still operating commercially as bush planes and air taxis. The Seabee is popular with air charter companies and small feeder airlines and is operated by private individuals and companies. ^ a b Norton, Bill (2004). Air War on the Edge – A History of the Israel Air Force and its Aircraft since 1947. Surrey, UK: Midland Publishing. p. 78. ISBN 1-85780-088-5. ^ "Seabees operated by Republic of Vietnam Air Force". Archived from the original on 2008-04-04. Retrieved 2007-12-26. ^ Bridgman, Leonard, ed. (1947). Jane's all the World's Aircraft 1947. London: Sampson Low, Marston & Co. p. 281c-282c.